Since Torah is emes and covers every topic, students should have a forum in which they can ask any question, even and sometimes especially on controversial issues not everybody feels comfortable addressing. In this class, the primary halachic and hashkafic literature on issues including Science and Torah, Feminism,Tattoos, Black Magic, Islam, Jewish sects, Dating and Marriage, Non-Jews, Deviancy and Yemos Hamoshiach are reviewed. Connecting to Hashem through prayer and reevaluating our relationship with Him. With the “Shaarei Halacha” as the source text, which is a fantastic work (translated from the original Hebrew) it teaches the novice, on a basic level, everything a Jew needs to know to live correctly today the shiur covered the entire book accompanied by lively Q & A, elaborations, illustrations and more. Every aspect of the Jewish day, year and life cycles are examined. ​If you are looking to have the satisfaction of finishing a Masechta this year. Look no further! This shiur will patiently walk you through an entire Masechta, not only explaining the literal reading of the text but also giving all the necessary background knowledge to each sugya. Spiced occasionally with some deeper insights. The agadata parts of the masechta are not merely glossed over and are explained in depth based on a lot of classical and chassidic works such as the Maharal, Negesh Hachaim Rav and Rav Tzadok hakohen. 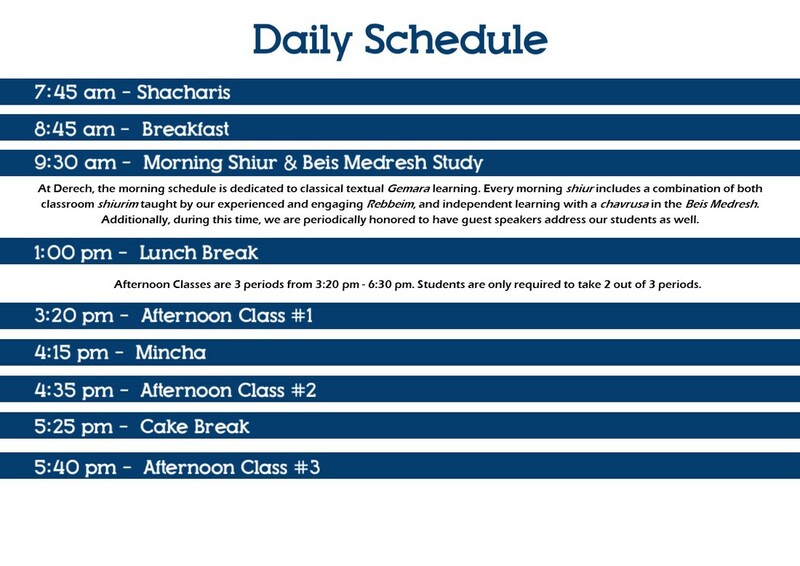 What has become an 'anything can happen , nothing is taboo, no holds barred' class in Derech, this shiur weaves together relevant topics for today's post high school students with the timeless lessons and clear logic of the Ramchal's classic work Derech Hashem. But to redefine your outlook on life is never enough without prayer. Included in the curriculum is spanning the width, breadth and depth of the Shemoneh Esrei, to unearth a connection to G-d that our students never knew existed. Finally, through out the year, the class covers random topics of Judaism with a focus on foundation building for such vital topics as teffilin, shabbos , bein adam l'chavero and many more. Also paying close attention to unraveling the beautiful secrets of each chag as they come. The early Prophets Neviim Rishonim: Yehoshua, Shoftim, Shmuel 1&2, Melachim 1&2 (distinctly different from Neviim Acharonim)The full mind-boggling, thrilling, and heart-breaking story of our people from the entry into Eretz Yisroel until after the destruction of the (first) Beis Hamikdosh. This shiur completed this entire significant portion of the Torah with Rashi and selections from many, many commentaries. An intense course in Conversational Hebrew. A deep understanding of the do's and don'ts of Shabbos encompassing the 39 melochas, rabbinical decrees, oneg Shabbos, Kiddush... everything you wanted to know about Shabbos and more. To finish an entire Seder of Mishna is not only a wonderful accomplishment, it also contains a wealth of knowledge on many of the major concepts in Shas. The goal is to finish off an entire seder of mishnayos in the course of the year . A goal we have met for many years. The full mind-boggling, thrilling, and heart-breaking story of our people from the entry into Eretz Yisroel until after the destruction of the Beis Hamikdosh. Reconnecting the students to the relevance of Torah learning at all levels of life. Talking to the heart of a teen allowing him to reassess his life within the framework of the Torah. Exposing students to the great relevance of halacha in every aspect of our lives. Ranging from the halacha that pertains to areas from snowstorms to earthquakes to the modern application of witchcraft and kabbala. Students will challenge the current view of ethical life and learn to apply Jewish ethics to areas of living they never dreamed of. Introducing the student to the original halachic sources. Bringing them from the earliest classic Halachic deciders thru the most modern day Poskim.